Farmer Al Courchesne always had an interest in agriculture and started farming after a career as a schoolteacher in Hawaii. 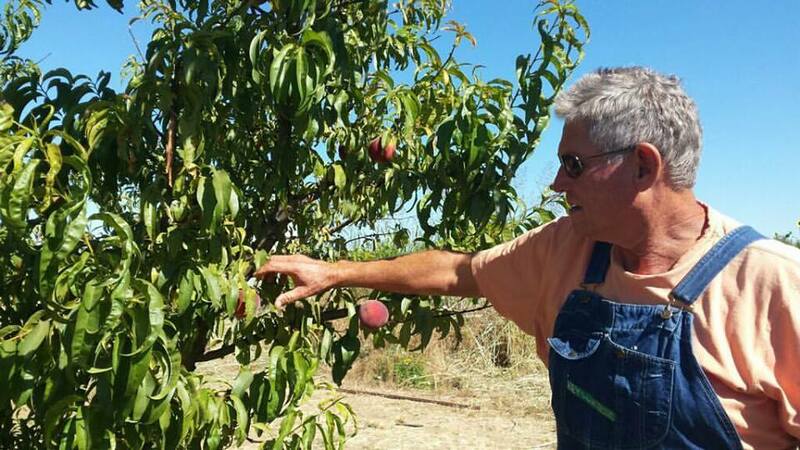 In 1976, Al purchased a 13-acre Brentwood property in Contra Costa County and founded Frog Hollow Farm, that today has grown to now over 200-acres of peaches, apricots, nectarines, apples, pears, persimmons, pomegranates, mulberries, cherries, and quince. The operation has been certified organic by California Certified Organic Farmers (CCOF) since 1989. Frog Hollow Farm has a farm stand which features homemade value-added products such as preserves, jams, and granola. The farm sells at 10-12 farmers’ markets per week and also has a Community Supported Agriculture (CSA) customer base. Frog Hollow Farm products can also be found online and at the cafe in the Ferry Building in San Francisco. Pollination is a common challenge in the fruit tree industry, as colony collapse disorder is causing honeybees to die off. Frog Hollow Farms was looking to enhance pollination with native bees in case colony collapse disorder becomes more widespread. Instead of paying for pollination services, Al wanted to have more bees living on the farm. “Although pollination is insurance that you’re willing to spend money on, it is wise to not rely on one vector of pollination to fulfill crops,” he says. Additionally, pests cause crop loss in the orchard. Brown rot is a disease that affects stone fruits under certain conditions during the blossoming, pre-harvest and harvest stages. The damage can be extensive and the disease symptoms include blossom and twig blight, cankers, and fruit rot. As part of an Integrated Pest Management strategy, Al planted California native flowers, native flowering shrubs, and hedgerows to provide habitat for native pollinators and insects that predate on pests. Pheromone traps were placed in the orchard. The farm also provides habitat for other beneficial species such as owls and bats. “With IPM it’s all about killing only the target pest; bats eat insects and owls eat the gophers that destroy the soil,” says Al. To fight worms that threaten his crop, Al uses biological controls such as the worm-killing bacteria Bacillus thuringiensis, or BT for short. To address brown rot in his orchard, Al worked on balancing soil moisture levels in his clay loam soil. By adding compost, he was increased water penetration, and retention. Permanent cover cropping in between the orchard rows built organic matter in the soil, and helps facilitate water infiltration while also creating habitat for beneficial insects. Al grows his cover crops from seed, and then mows and tills them back into the soil once they begin producing their own seeds. Al realized that a sound integrative pest management and pollination strategy was going to require diligent monitoring. Al was having difficulty finding the time to track all of the pheromone traps that he had placed in the orchard while simultaneously managing the business aspects of the operation. Frog Hollow Farms made the decision to work with an Agricultural Pest Control Advisor (PCA) who checks the traps, observes flight patterns, monitors population changes, and records data. Each year this information shapes future management decisions such trap placement and where on the farm more bees are needed. Identifying the correct amount of compost to apply has also been a challenge. Through a process of trial and error, Al has settled on an application of five tons of compost per acre for every block of trees, and as a result the trees now produce a healthier crop with reduced brown rot. Frog Hollow Farms discovered that they could produce better compost than they were buying and compost production is now done on-site. Crop residues, fruit byproducts, pruning materials, packaging and food scraps from the on-site commercial kitchen which would otherwise leave the farm and go into the landfill, all get recycled into the compost program. Thirty-five hundred feet of hedgerows were planted and include an array of Manzanita, lavender, ceanothis, and salvia that attracts bees and beneficials such as lady bugs, preying mantice, lace wings, and pirate bugs.